Remem­ber the times were you play H-O-R-S-E with friends in the back­yard? What can be bet­ter than play­ing it with an actu­al NBA super star, and beat­ing him at it. 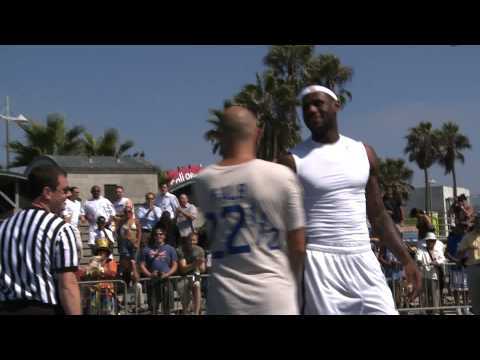 Thought a bit late in post­ing, here’s a video short doc­u­men­tary that I got to track down of NBA All-Star LeBron James get­ting schooled by con­tes­tant David Kalb at Venice Beach, Cal­i­for­nia ear­ly last month (Sep­tem­ber). Any­ways, Octo­ber is when most of the fun begins for those of us who are play­ing Fan­ta­sy Bas­ket­ball and/or just fans of the game. It’s also a time to check out trades, injury reports, and high­lights dur­ing the NBA Sum­mer League in Vegas. Just like pre-sea­son of most sports, it’s the time were hopes of your team win­ning the Cham­pi­onship is at its peak and out­most glo­ry. Sim­ply because every­one has a clean record, 0–0. But for me, per­son­al­ly, GO LAKERS!